After the absurdity that was Dortmund’s first leg against the Norweigan Odd BK, Tuchel’s side had a more straight-forward 90 minutes in the return fixture. Despite going behind in the 19th minute due to having men on the posts for an Odd BK corner, they came back quickly and continued to control the game throughout – maybe last year, Odd BK. Tuchel made a few changes to the side that scraped home a victory in the first match against the Norweigan side, with Reus in for Aubameyang up front, Hofmann took Kampl’s place on the right of midfield amidst the Slovenian’s transfer to Bayer Leverkusen. In defensive midfield, Julian Weigl took Sven Bender’s place whilst Sokratis Papastathopolous came in for Gonzalo Castro in the defensive line, with Ginter moving to right-back. Despite having a difficult time as Dortmund’s number one in the first leg, Roman Weidenfeller kept his place as Dortmund’s cup goalkeeper. Ahead of him sat a 4-chain of the again-excellent Marcel Schmelzer, sided by an equally-strong Mats Hummels who partnered Sokratis at right centre-back. At right-back was Matthias Ginter who, after a strong game against Ingolstadt, again played well in an attacking role. Julian Weigl, Dortmund’s best transfer business of the summer, sat as the deepest point of the midfield and again put in an excellent performance. The young midfielder who was signed from 1860 Munich over the summer has made an excellent start to his career in the yellow and black shirt, displaying great intelligence in a key role for Dortmund’s possession game. On the right of the young midfielder was Ilkay Gundogan, another player who has made an excellent start to life under Thomas Tuchel. In a slightly higher-up role than the above mentioned, the German’s excellent passing has been crucial to the penetration of Dortmund along with Kagawa who finished the triangle at the top. The brilliant Mkhitaryan again featured on the left whilst Jonas Hofmann, who is now with Dortmund following a loan spell at Mainz last season, took on the right flank. In Aubameyang’s absence to the bench, Marco Reus was given the striker’s position by Tuchel and responded by firing in a hat-trick of goals. All three of which came from either low crosses or cut-back assists. In the first match, Odd BK’s man-marking scheme showed some issues against the fluid midfield of Dortmund. With both Mkhitaryan and Kampl moving inside from their originally-wide positions, they could often overload the centre and find gaps relatively easily, an example being in the scene below. An image from the 6th minute of the first leg where Weidenfeller broke ODD BK’s press. The coaching staff at Odd BK seemed to take notice of this to some degree as in the return fixture we could see a slight shift in their defensive strategy and tactics. Where the Norweigan side pressed quite high up the pitch in the first leg, they were more reserved and didn’t look to challenge the possession as close to the BVB goal in the second. To some extent, this allowed for a better stability within their own half and reduced some of the issues which they had in the first game (albeit they were still more than apparent). There was one exception in this, as the away side looked to press high up field when Dortmund were restarting their build-up play from a dead ball situation. This is likely because the defending side will have had a better opportunity to prepare their press thus making it more effective, however similar issues to the first leg still came back. In addition to the different level of aggression in their pressing, they also looked to keep an extra midfielder in the centre who tried to maintain access to both Weigl and Gundogan, whilst he would move onto Kagawa should the Japanese midfielder drop deep. Again this was most likely an attempt to increase the stability of the pressing, this time by maintaining a presence in the centre. This meant that there was a trio of Dortmund players free high up the field however as Weidenfeller quite commonly looked to find them through a direct pass. Fortunately for Odd BK, the goalkeeper’s passing wasn’t as effective as it was in the first leg, though he still managed to find them on a couple of occasions. When they looked to press higher, similar issues arose for Odd BK. This lower block did cause some alternative issues for the away team however. When Dortmund had ball possession in midfield within the opposition half, the away side attempted to press with some intensity yet struggled to maintain access throughout the game. During these moments they obviously struggled to maintain the necessary pressure on the ball considering its dangerous position and this allowed Dortmund to make uncontested circulations which were usually switches to the under-loaded side, as is Tuchel’s implemented model of play. Another issue for the Norweigan side came on the flanks. Especially during the opening stages of the game, they made little attempt to support their full-back, especially down the right side. The right-back was often strangely passive and disengaged in the first few scenes down Dortmund’s left which made for easy penetration through the excellent Schmelzer. Admittedly, Dortmund were effective in occupying the nearby players down the flanks which helped to isolate the full-back. However, considering the threat which Tuchel’s side has made so far from these areas, Odd BK should have placed a higher importance on defending these patterns of play. Considering the great effectiveness which Dortmund have shown from this area of the pitch, it was unsurprising to see that Drtmund yet again focus their play through the left half-space. 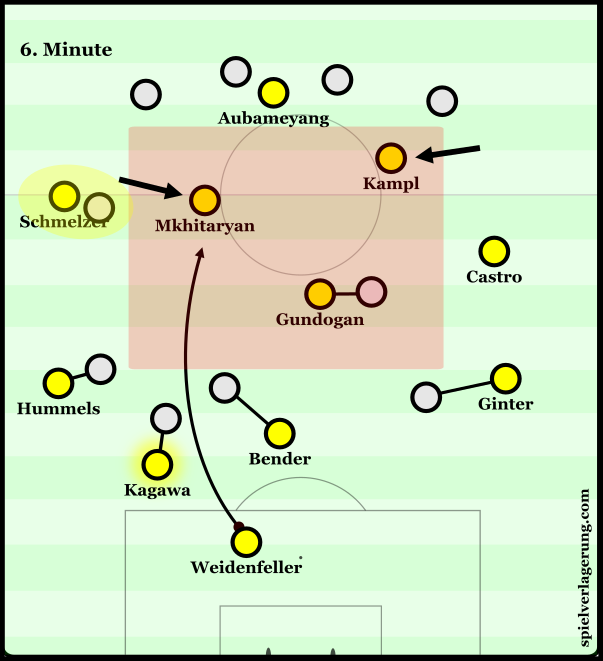 The tactics were perhaps slightly more direct than from what we have seen yet under Tuchel as they attempted to access Schmelzer (and situationally Mkhitaryan when wide) through diagonal passes earlier in the possession than in previous games. This is likely due to the issues which Odd BK had with their right-back, which in many scenes created a situation where Dortmund didn’t have to work as hard to disrupt the organisation of the opposition. BVB using their players to occupy the RB and RM of Odd BK, giving direct access to Schmelzer. 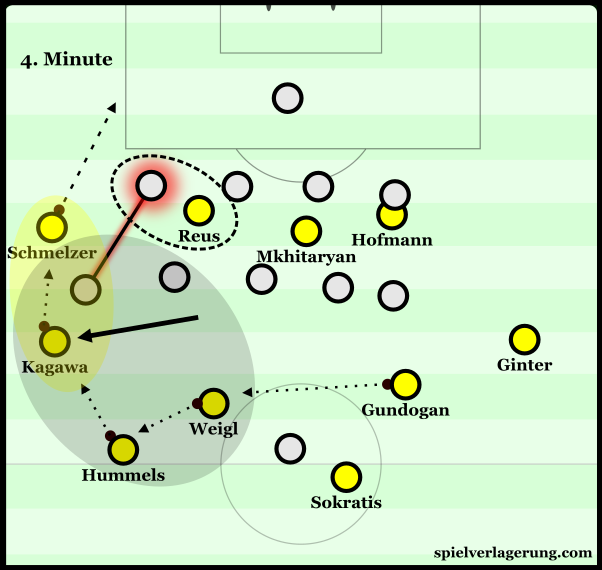 This was typified as in a number of moments, instead of having the likes of Reus and Mkhitaryan move to support the combinations, they would simply occupy the wide players which would allow direct access to the attacking Schmelzer. Dortmund using their more common overloads in the left. Dortmund didn’t completely disregard the use of a more patient approach and still used combinations on a common basis but the above was the showing of a tactic which we haven’t seen on such a frequent basis yet. The left overloads which we have seen become a common feature of Dortmund’s attacking strategy were generally developed in a similar fashion to how we have seen in the season so far. 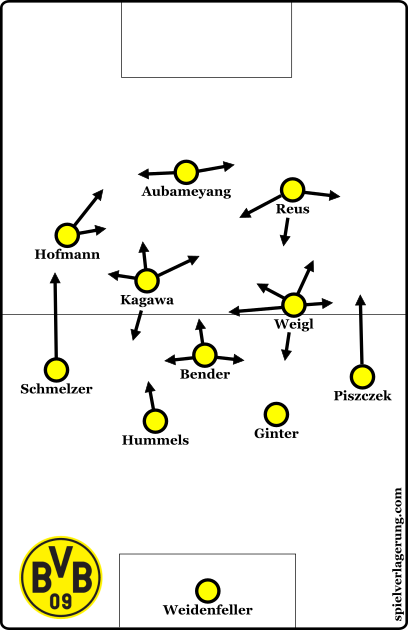 Weigl frequently shifted left, supporting the positional structure in accordance with similar movements from Hummels whilst Kagawa also shifted frequently to create the overloads higher into the opposition’s half. With the game practically over at the 60th minute with a 6-1 scoreline, Tuchel decided to make all three changes within a period of around 4 minutes with Sven Bender, Lukasz Piszczek and Pierre-Emerick Aubameyang all coming on. The shape for the final 25 minutes of the game. Bender came on to the pitch in replacement of the great Ilkay Gundogan, moving to the deepest 6 position whilst Weigl took on the 8 role in Gundogan’s absence. Albeit the result was already without doubt, this gives somewhat of an impression of Tuchel’s opinion of the young midfielder and the new signing continued to shine in an albeit slightly different role. He provided the same positional support which he does on the left now in a slightly higher position whilst situationally he would still come across and balance for Hummels. 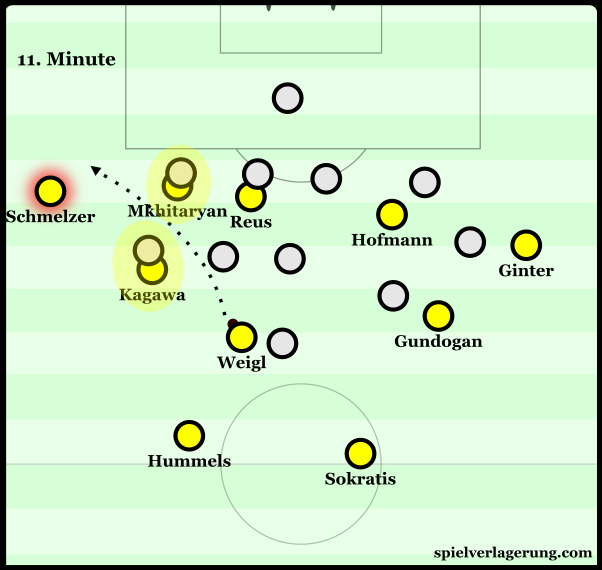 With Weigl down the right, Kagawa’s role became more oriented to supporting the structure and would drop slightly deeper in the left half-space to support the connections through that area of the pitch. In other cases it would be Marco Reus who would drop deeper with more freedom as he had Aubameyang to occupy the defensive line in his absence. Overall it translated into a sort-of asymmetrical 4-4-2 shape, however the formation itself was of little importance primarily due to the fluidity across the midfield and attack. 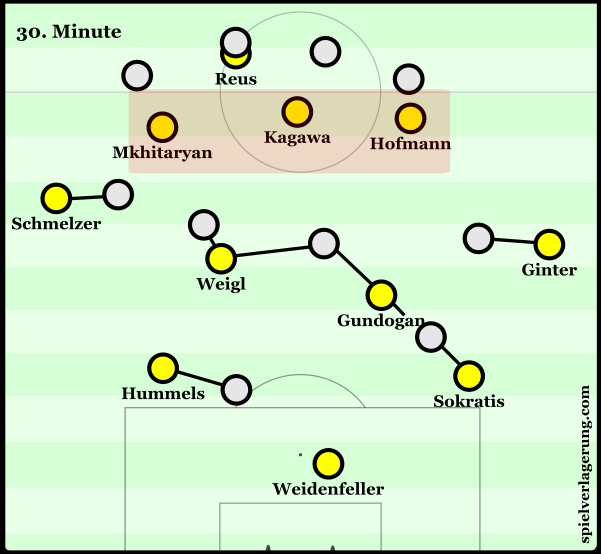 Both Weigl and Kagawa in particular had wide-reaching roles and would often make long movements to provide support in alternative areas of the pitch. Both players’ movements were relatively free and would often move into spaces purely to further improve the Dortmund positional structure. Obviously this is Weigl’s usual role down the left of their 4-2-3-1 but was a slight adaption for Kagawa who is usually more oriented towards penetrating the opposition. 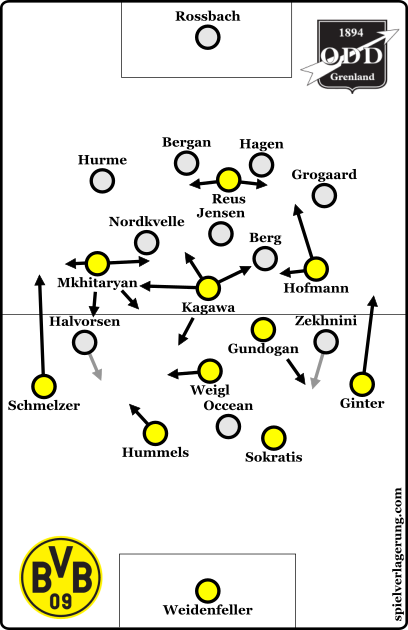 With the freedom of the scoreline, Dortmund had the room to play with more variance in their attacking strategy. The ball was increasingly more often on the right flank where Reus was moving outwards alongside both Weigl and Piszczek whilst they preferred to open spaces in the centre and right half-space as opposed to wide isolations. It was less common that they would directly play towards the left and instead varied their approach as they placed more value on creating dangerous situations as opposed to utilising more of a pre-planned and repetitive set of tactics. Despite again conceding the first goal against Odd BK, Dortmund made another completely dominating performance as they maintain their 100% record in competitive matches for the early 15/16 season.